Miss Kelly Goh, 25, had to live with the guilt and trauma of seeing her father fall eight storeys to his death. The five years since then have been a slow process of recovery, aided by a family friend who took her into her home to care for her. She tells her story to The Straits Times, in this series about millennials who inspire us. SINGAPORE - Within a year, Miss Kelly Goh had lost both her parents in tragic circumstances. Her mother, a coffee shop assistant, died in 2012 while undergoing treatment for late stage breast cancer. One day, Mr Goh Ah Seng found his wife unconscious at home, and though she was taken to the hospital, she died the next day. Miss Goh was their only child. Just 19 at the time, she drew closer to her father, a taxi driver. Barely a year later, she saw him fall to his death. "I felt so guilty as my father died trying to pick up something that belonged to me. I felt that it was my fault," she said, bursting into tears when recalling the tragic accident. "I was mummy's and daddy's girl and just like that, I lost both of them and became an orphan. Words cannot describe my pain." On that fateful day in March 2013, she had hung her canvas shoes out to dry on the metal rack outside her ninth-floor window, as they had been drenched by rain. But one of the shoes fell and landed on their neighbour's air-conditioning ledge a storey below. Miss Goh told her father about it and said she would buy a new pair of shoes or ask their neighbour to retrieve her shoe. She was taking a shower when she heard her father calling her name urgently. Rushing out of the bathroom, she was shocked to see him on the air-conditioning ledge below. She told the 58-year-old man to stay put while she got help, but he tried to climb back up to their flat, and fell. What happened next is still a blur. She knows she called an ambulance as well as Ms Stella Soh, a friend her father knew through temple activities, who had helped with arranging the funeral for Miss Goh's mother. Ms Soh, a 45-year-old mother of three children, also took care of funeral arrangements for Miss Goh's father, but she did more than that. She said: "I couldn't bear to send Kelly back home alone. She was traumatised. It was the most natural thing to bring her back home with us. I had to make sure she did not fall into depression." Overnight, Miss Goh, who was then studying at the Institute of Technical Education (ITE), went from a care-free teenager to an orphan with post-traumatic stress. She suffered flashbacks about the accident and needed counselling to cope. She says that Ms Soh - and her family - was the rock she clung to. Ms Soh, who handles sales in a company selling fruit, always made sure there was someone at home with Miss Goh. She even bought a puppy, and having a dog to play with made her happy, Miss Goh said. For her part, she told herself she needed to think positively and live her life well as that would have been what her parents wanted. 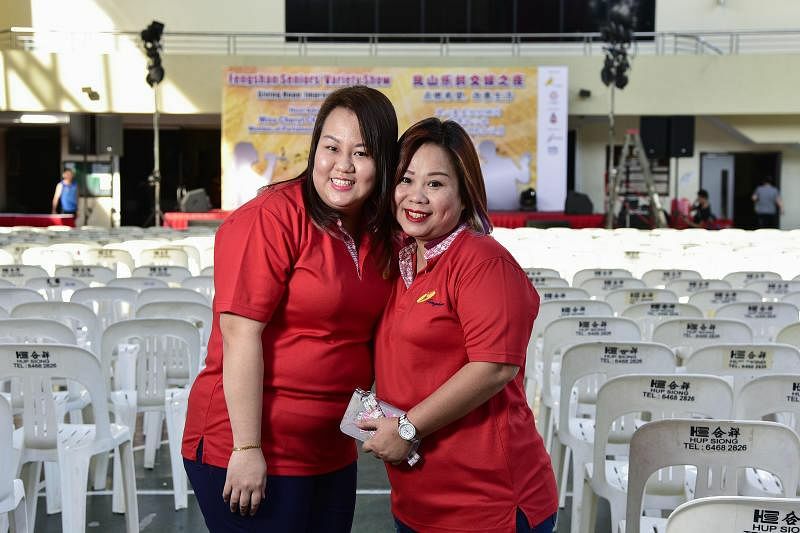 Ms Soh, a grassroots leader in Bedok, also involved Miss Goh in grassroots activities. As the chairman of the Fengshan Area Sub-Committee, she encouraged her young friend to help out with door-to-door visits and other events, to keep her meaningfully occupied and contribute to society. Miss Goh was receptive and found the work helped her even as she was helping others. "I got to know more people," she said. "When I interact with elderly people and some are in wheelchairs, I feel lucky to be young, mobile and have people who care about me. I feel that I should not dwell on my unhappy past." She volunteers regularly now with the Fengshan Community Club Youth Executive Committee, helping in "whatever way I can" at events. She graduated from the ITE with a Higher Nitec in Service Management and is currently pursuing a part-time diploma in Human Resource Management at the Kaplan Higher Education Institute. She is also working as a customer care officer in a firm making paint. Yes, she said, she still misses her parents dearly. But she is immensely grateful to Ms Soh, who showered her with love and care. She said: "Aunty Stella took care of me like her daughter. I treat her like she's my mum. I'm so thankful she took care of me for five years, making sure I ate and slept well." Recently, she moved out of "Aunty Stella's" home as she felt ready to live alone. Ms Soh, who described Miss Goh as simple, kind and filial, said she grew to be a lot more independent after her parents' deaths. Miss Goh agrees, and said her attitude to life has changed. For one thing, she treasures it a lot more now, knowing how fragile it is. For another, she has discovered how kind people can be to one another. "For those who have lost their parents, you are not alone. You still have friends and relatives around you. Stay positive," she said. "We still have a long way to go and we have to live life well."